Since its launch in 2000, HoldtheFrontPage has established itself as one of the top media recriuitment websites in the UK.The site now attracts an average of 62,000 monthly users according to Google Analytics and has more than 19,700 followers on Twitter. Jobs search box and Featured Jobs scroller visible on all 26,000-plus pages of the site. Tabbed widget on jobs homepage making jobs easily searchable by category, region and industry sector. All jobs automatically tweeted to our 19,000-plus Twitter followers. Worldpay payment gateway enabling all job postings to be handled online. Free CV listings for all jobseekers which can then be viewed by logged-in employers. Enabling jobseekers to apply for jobs online directly via our site. All job ads continue to start at £175 + VAT for one week, £275 +VAT for two weeks and £375 +VAT for the premium listing package which enables vacancies to appear for up to eight weeks. Premium listings are unlimited in timescale and automatically appear as featured jobs in the homepage scroller for the duration of the advert, giving your vacancy added prominence. We also continue to offer a featured listing upsell for the one week and two week options at an additional £50 + VAT per week – see details below. Special discount rates are available for new or lapsed advertisers, recruitment agencies and block bookings. Contact us on 01332 895994 or email sales@htfp.co.uk to find out more. For an extra £50 +VAT, your job advert could benefit from increased exposure by sitting at the top of our home page for a week. The job title will be a live link straight through to your advert ensuring it reaches an even greater audience and offering you the maximum potential of finding the perfect candidate. 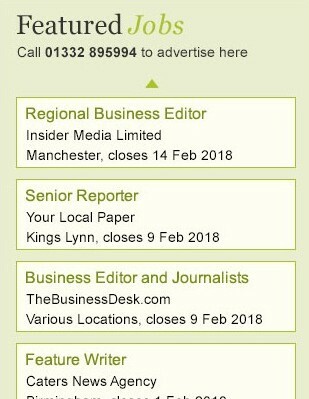 In addition to remaining on the home page for the duration of the advert, your job will also be highlighted with a box advert on our daily email bulletin, read by more than 2,500 journalists, editors, freelancers, lecturers and students. For more details email sales@htfp.co.uk or call 01332 895994.